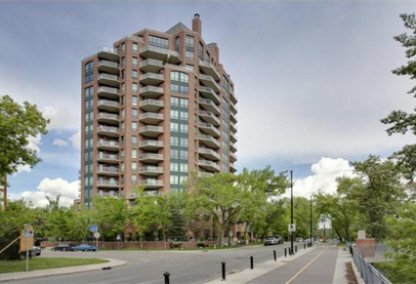 The Grandview condominium is one of the most prestigious residences in Calgary. This high-end development is located at 228 26th Avenue, on the edge of the easy-flowing Elbow River in Connaught. The Grandview is a 16 storey condo complex, topped with a distinctive chateau-style copper roof that is visible from miles away. The building's construction was completed in 2002 by Streetside Development Corporation, and houses 56 condos. This is a beautiful complex with state-of-the-art systems, and some of the best views of the city and the Elbow River Valley. Homeowners here enjoy a serene riverside lifestyle, in the heart of Calgary. Learn more about amenities at The Grandview condominiums, or see all condos for sale below. The Grandview is a luxurious and secure building in an excellent location. It's just a short distance from downtown, yet nestled away from the hustle and bustle of city life. The Grandview condominium complex is located near green spaces and offers convenient access to stylish restaurants and trendy shops. 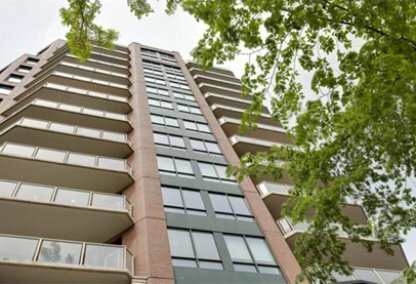 All Grandview condos feature floor to ceiling windows that allow cascades of natural light to stream in, and provide unobstructed views of the city. Most condominiums at The Grandview come with two spacious private balconies, while a few exceptional units have up to five balconies with views in different directions. The two penthouse suites sport three-sided glass sunrooms and decks, while all units come fitted with wide entry doors, high ceilings, and tinted windows. The Grandview has several on-site amenities, including a a well-appointed lobby that leads to a large, manicured garden surrounded by a patio. This is a great place for hosting friends and having picnics. There is also space in the building to meet and dine, as well as a reading room that comes complete with a welcoming fireplace. 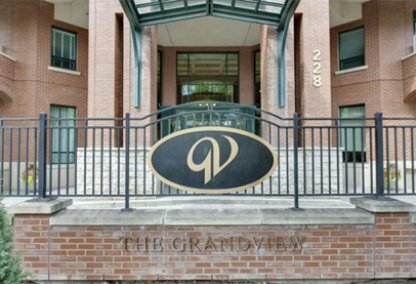 To arrange a tour of available condos at The Grandview, please contact us today!